Tired of the same old fancy cakes? Why not go back the traditional Malaysian kuih (or bite sized snacks in English) and enjoy a sweet taste of the good old days. 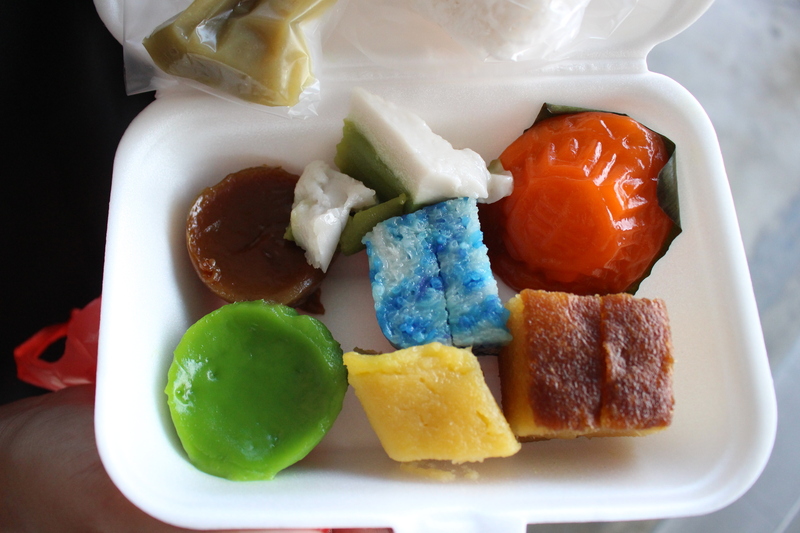 The thing about kuih is that it’s getting harder to come by. Because the art of making kuih is hard and takes a long time to master, finding a kuih vendor not as easy as it used to be. But we managed to track down a few spots here in Klang Valley for you! Here are our favourites. A holy grail on most lists, the shop offers a variety of kuih. Whilst the décor looks basic, the sweet treats sold here make up for it. 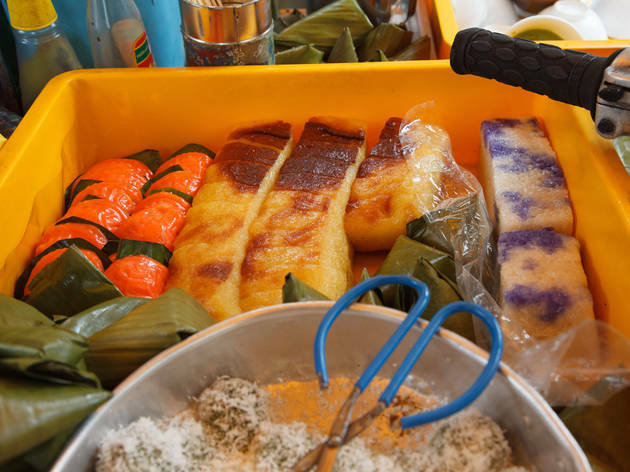 Take your pick from colourful chewy kuih angku, pulut tai tai accompanied with kaya and also kuih sago, amongst many others. The owner, Mrs. Lim makes the kuih herself so you can be sure it tastes deliciously authentic. What they’re selling is pretty obvious from the name of the shop. Located in Shah Alam, this shop sells Malaysian kuih like lepat pisang (mashed bananas mixed with shredded coconuts and steamed in banana leaf), kuih koci, kuih lapis (nine layered steamed caked often comes in a rainbow of colours), akok and many more. You can enjoy a good evening either with your pals or savour some alone time with their sweet treats, accompanied by coffee or tea on the side. If you’re a fan of ondeh-ondeh (a glutinous green sphere bursting with gula Melaka and covered in shaved coconut) that bursts in your mouth on the first bite, this is the place to go. Besides that, you can also include their kuih ketayap (caramelised gula Melaka with shredded coconut wrapped in a pandan crepe), seri muka (a combination of the blue glutinous rice top with a layer of pandan), kochi nyonya and more. They also serve delicious meals like laksa, curry mee, and even their packed fried Siam bihun tastes good! Lee Yeok Choi has been a vendor for over 40 years. Come 3pm everyday, you’ll definitely see him in the same exact spot – outside Nam Chuan Coffee Shop in Bangsar’s Lucky Garden. He’s just a simple guy but people his rich selection of beautifully-made kuih. If you happen to be in the area, don’t forget to stop by and pay him a visit. He’s usually there for about 2-3 hours before he sells out. Tip: See what his regulars buy and you won’t be disappointed cos if everybody’s buying it, you know it’s bound to be good! If you’re familiar with the famous TMC curry fish head stall in Bangsar, then you may have notice da little stall next to it that sells Appam – thin, crepe-like pancakes made of watery rice flour and coconut milk. 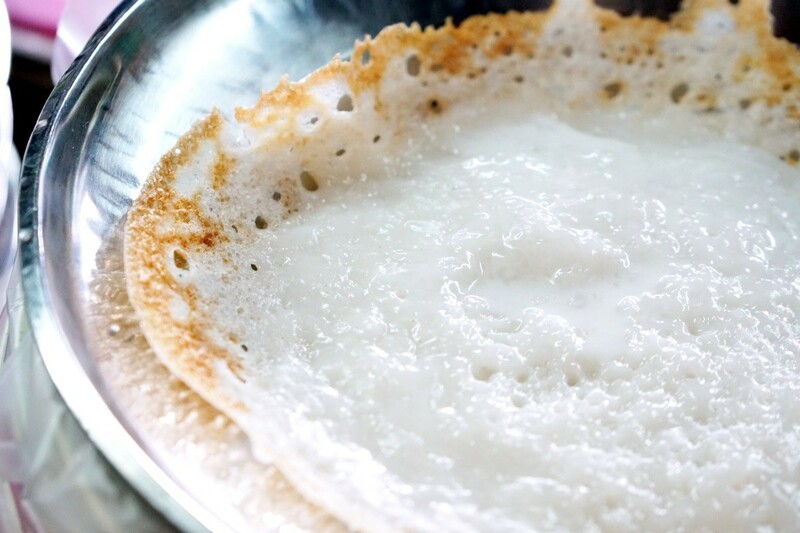 Cooked to perfection, the appams there are freshly made-to-order so you can experience the soft coconut milk-infused centre with a lacey crispy edge for that crunch whilst it’s hot. If you’ve got a sweeter tooth then ask for caramelised brown sugar on top. So worth it! This business started in 1992, when a mother and daughter decided to sell kuih on a small scale at the Pasar Moden Taman Tun Dr Ismail. But soon after, their business boomed and they managed to afford to rent a space at the TTDI Market, selling a variety of Malay and Nyonya kuih. You can try out their selection of kuih bakar pandan (baked pandan fragrant cake), kuih talam pandan (two layer kuih — the top is a jelly-like layer that has a salty coconut flavour while its bottom is made from rice and mung bean) and kuih Ko Swee (made from tapioca starch, rice flour and covered in a layer of shredded coconut).